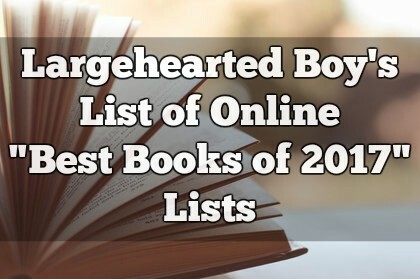 For the tenth straight year, I am aggregating every online year-end book list I find As the lists appear online, I will add them to the master list, updating regularly. Please feel free to e-mail me with a blog, magazine, newspaper, or other online media list I have missed. See also: Largehearted Boy's List of Essential and Interesting 2017 Year-End Music Lists. Please consider making a donation or leaving a tip to Largehearted Boy to support the website and posts like these.